E-mail while I am out of Sweden: ""perantoniohansson@hotmail.com""
The home of the Iceroadracing camp is a small village called Nälden, 20 minuts from the state capital Östersund. 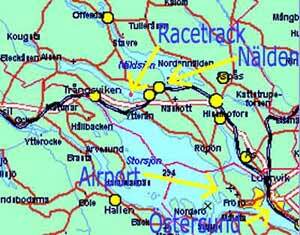 Östersund has a modern airport but You can also reach Stockholm in 7 hours by car, bus or train. By air there is several flights a day to and from Stockholm, but has also connections to other citys included Trondheim in Norway. The airport have car-rental and for bigger groups it is possible to make a snowmobile safari directly from the airport to your place to stay. I have no possibility to pick you up at the airport but i recomend car-rental or taxi. To get down to the lake is the same problem if you dont rent Snowmobiles or have rental-car. The State (Jämtland) is the best wintersport area in north of Europe with ÅRE as the bigest downhill area 45 min away.